Matching Dragoons: Jonah Hex #37 "Stonewall!" Ummm...well gosh, this is just so tragic. 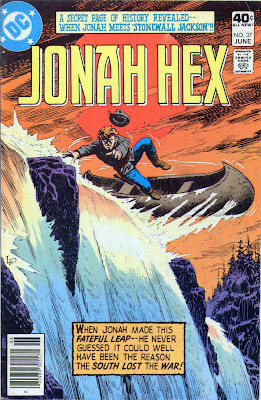 But what really perplexes me, is why would Jonah have any experience with canoes, just because he hung out with the Apaches? I don't really think that Apaches and canoes GO together. There aren't a lot of birch trees or rivers in the desert. So, Jonah was the one that winged old Stonewall? Oops. 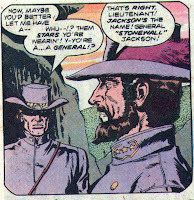 I thought it was a pretty racist thing for Stonewall to say, but this IS the DC universe where there are huge waterfalls in the Louisiana bayous, you can ride from west Texas to Virginia in 12 hours on horseback, and there are snowcapped mountains in the panhandle of Oklahoma. Heh. You make a very good point. The Hex landscape was indeed a strange and wondrous place. I don't get why Jonah Hex is receiving much low ratings. It is rattling diverting, and has teemingness of activeness and shadow comedy. I've never read any of the comics, so I couldn't comparability it. Josh Brolin pulls an surprising execution as Book Hex. One night, Jonah's dominating official, Quentin Turnbull murders Prophet's phratry and brands his tackling with a hot implement.